More than four in 10 cancers - 600,000 in the UK alone - could be prevented if people led healthier lives, say experts. Obesity contributed to 88,000 cases and alcohol to 62,200. Sun damage to the skin and physical inactivity were also contributing factors. Prof Max Parkin, a Cancer Research UK statistician based at Queen Mary University of London, said: "There's now little doubt that certain lifestyle choices can have a big impact on cancer risk, with research around the world all pointing to the same key risk factors. "Of course everyone enjoys some extra treats during the Christmas holidays so we don't want to ban mince pies and wine but it's a good time to think about taking up some healthy habits for 2015. "Leading a healthy lifestyle can't guarantee someone won't get cancer but we can stack the odds in our favour by taking positive steps now that will help decrease our cancer risk in future." 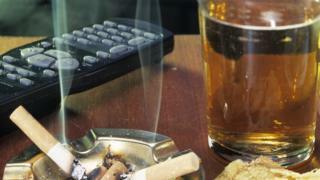 Public Health England says a healthy lifestyle can play a vital role in reducing cancer risk. It says campaigns such as Smokefree, Dry January and Change4Life Sugar Swaps all aim to raise public awareness.